Received the following via email. It isn't about trains or model railroading, but we thought it important enough to post. Please feel free to copy it into your own email and pass it along. Please join us in this FLY THE FLAG campaign and PLEASE forward this email immediately to everyone in your address book asking them to also forward it. We have a little less than two weeks and counting to get the word out all across this great land and into every community in the United States of America. If you forward this email to least 11 people and each of those people do the same...you get the idea. Honestly, Americans should fly the flag year-round, but if you don't, then at least make it a priority on this day. on a recent trip to Orlando, Florida's Disney World, I didn't forget to pack my railfanning interest in the suitcase for this trip. 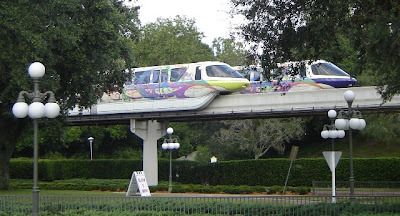 One of the most interesting aspects to moving people around the park's Epcot and Magic Kingdom resorts in a efficent manner would be Disney's monorail system. This 13.6 mile monorail system will carry over 150,000 guests to the Magic Kingdom and Epcot parks on an average day. At Epcot's World Showcase German pavilion, there is also a well designed and attractive garden layout that can be seen. The current model of monorail began operation in 1990, with the full fleet of 12 in service by early 1991. The Mark VI has a higher passenger capacity as well as improved air conditioning, door systems and improved safety features. Each Mark VI train consists of six cars. The overall length is 203 feet with a capacity of 365 passengers. A quick glance at some of the cars initially lead this causal observer to believe that some cars were vandalized with grafitti! I later saw that these are Disney-themed designs on these cars. Following article is from the Cincinnati Enquirer for Monday, 8/20/07. ELMWOOD PLACE -- A man walking across the Township Avenue railroad crossing was struck and thrown 50 feet by a Norfolk Southern train this morning. A witness, Mike Billups, of Deer Park said the man was text-messaging on his cell phone at the crossing just before the accident, which occurred about 10 a.m.
Billups said the man waited for a southbound CSX train to pass. After it cleared the crossing, the man walked forward and was struck by a northbound train. The man may have been distracted and unaware that a second train was coming in the other direction, Billups said. Col. William Peskin of the Elmwood Place Police Department said he also had heard that the man was text-messaging and possibly distracted. The crossing is maintained by Norfolk Southern and had all gates and lights in working order. The unidentified man, who is in his 20s, was taken to University Hospital by St. Bernard rescue. Elmwood Place Mayor Richard Ellison, who went to the scene, said the man appeared “a little roughed up” with a nose bleed, bump on the head and some scratches but appears as if he will be OK.
Ellison received a call about the man being hit by a train and immediately went to the area. “There were five witnesses. I talked to three of them myself,” Ellison said. The witnesses told the mayor they saw the man wait in front of the double gate for a southbound train to pass before crossing the tracks while text messaging on his cell phone. That’s when he was hit by the northbound train. “The horn was blowing like mad and the kid was text messaging,” Ellison said. “The kid apparently was just daydreaming. The railroad crossing has had “practically no” incidents in the past, Ellison said. Zachariah Smith, 18, waited around 10 a.m. for a southbound train operated by Jacksonville, Fla.-based CSX Corp. to pass. He then walked around a gate and onto the tracks, apparently unaware that a Norfolk Southern Corp. train was coming from the other direction, said witness Mike Billups. "The horn was blowing like mad and the kid was text messaging," said Mayor Richard Ellison, who went to the scene and talked to several witnesses after hearing of the accident. "The kid apparently was just daydreaming." Smith was knocked out by the collision, Billups said. After regaining consciousness, Smith was taken by paramedics to nearby University Hospital in Cincinnati with undisclosed injuries. He was listed in serious condition Monday night. It was not clear how fast the train was traveling. Gates and lights at the crossing, which is maintained by Norfolk, Va.-based Norfolk Southern, were in working order, said Elmwood Place police Col. William Peskin. 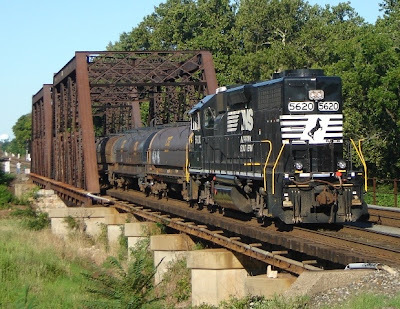 NS 11J @ 8:20- would have NS 9883 (C40-9W) and NS 2659 (SD70M-2) for power to bring ninety-six auto racks west. MA-1 @ 9:16- headed east out of Manville yard with thirteen coil cars behind PRR 3048 (GP40-2, ex-CR 3364) and CSX 6109. PRR 3048 certainly looked like it had seen better days of service! 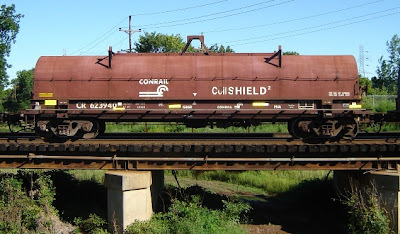 Another interesting sight was the appearance of a CR CoilShield car mixed in amongst the CSX Coil cars. CSX Q300 @ 10:05- would take its ninety-one cars of mixed freight east after finishing work at the Manville yard. Motive power would be two C40-8Ws, CSX 7888 and CSX 7780. NS 212 @ 10:35- looked more like NS 18N with all of those auto racks! 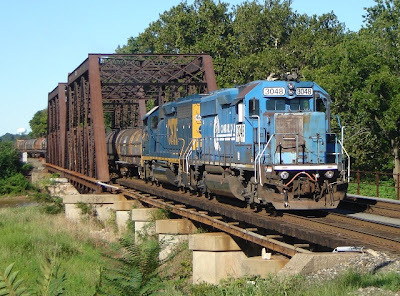 NS 9404 (C40-9W), NS 2532 (SD70) and NS 8311 (C40-8) would comprise the power consist. Falling into the "heard about but not seen" category was NS I4V and an NS westbound power move. 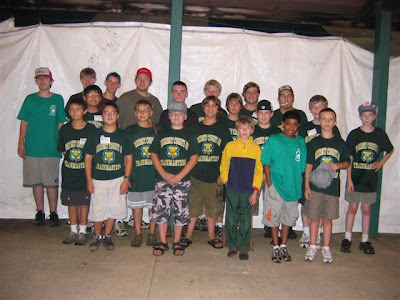 Here is a picture of the Somerset 4H trainmasters at the end of the Somerset County 4H Fair. See posting below for more information. 8:12 NS 212-had a quartet of GP60s for power, NS 7135, NS 7146, NS 7123 and NS 7141. Considering the inordinate amount of autoracks to be seen, this train could have easily been mistaken for NS 18N. 8:30 MA1-would have NS 5620 (GP38-2) taking ten CSX coil cars east. 9:30 NS 11J-NS 9297 (C40-9W) and NS 8821 (C40-9) had thirty-seven autoracks in tow as it headed west past my vantage point. 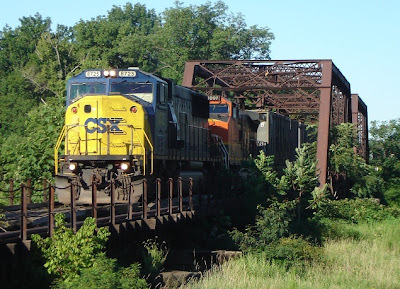 9:41-CSX Q300-was finally given permission by the dispatcher to proceed east along the Lehigh Line. Today's train had a number of garbage container flats in its consist of eighty-five cars that it reminded me of CSX's K206. Motive power would be CSX 8752 (SD60I, ex-CR 5647) and BNSF 1097 (C44-9W). Hope that your morning was just as enjoyable! 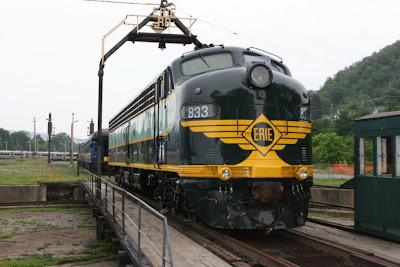 Pictures below are of the recently repainted Erie E8A on the turntable at Port Jervis, NY taken on 7-29-07. (See also posting below about this locomotive.) 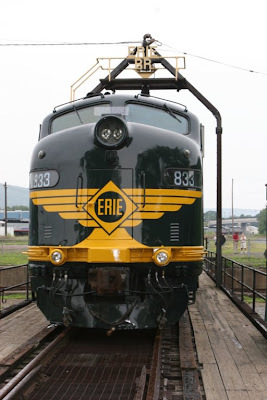 The E8A belongs to Jimmy Wilson, New York and Greenwood Lake RR. 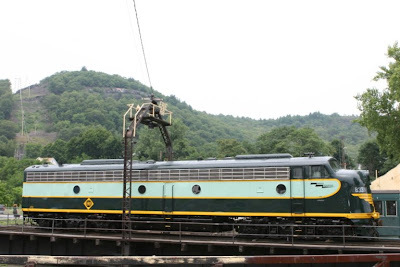 It was repainted at Ringoes, NJ and towed to Port Jervis by NS. 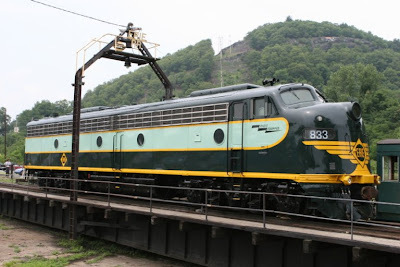 New York and Greenwood Lake RR plan to put up an enclosure at the turntable area in Port Jervis which would encompass the E8A, the Alco(? ), the GP9m(?) and two pieces of Private Varnish that have been refurbished and become a tourist attraction. They also plan to do passenger car restoration at this location.